Happy 2019! 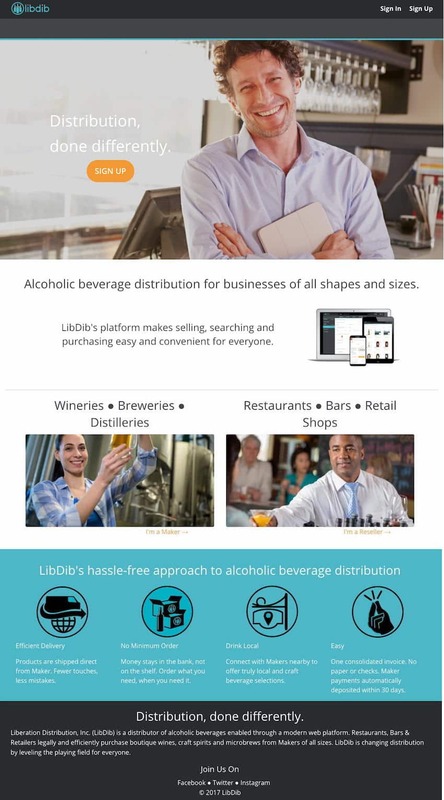 Heading into the new year, LibDib is here for all wine and spirits producers looking for compliant three-tier distribution in three states (and many more to come!) All licensed Makers now have access to buyers in New York, California and Wisconsin. But where does one start with planning distribution? Even in just three states, there is potentially a lot of ground to cover and plenty of opportunity for those who are ready to hustle. Let’s clarify hustle real quick. This industry is super competitive. Just walk into any liquor store or wine shop. Shelf space is limited and every single bottle that takes up a slot is potential competition. There are literally hundreds of thousands of choices out there for buyers. Makers need to be prepared to hustle…to work hard, contact people, pitch their story, send samples, follow up, and sell through. The hustle happens with LibDib Makers, but it is also expected in pretty much every distributor-Maker relationship. Before even taking on a brand, distributors want to know: What are Makers are going to do to sell it through? The LibDib model is different in that we do not have massive amounts of inventory; so we allow for any Maker to have access to three-tier distribution. However, just because a Maker posts something on LibDib, doesn’t mean it is going to sell, let alone sell through (again, just like with almost any distributor). There is work to be done in order to be successful in this hyper-competitive world of beverage distribution. Our platform has some pretty cool tools that can help, but ultimately, Makers are in charge of their own destiny. This should not be a surprise to any Maker. The hustle is what sells product. With that said, here’s an easy to follow formula to start building your distribution, one case, one account at a time. #1 – Research: Ask yourself what accounts do you want to see your products in. Are you targeting high-end bottle shops, white tablecloth restaurants? Neighborhood cafes or independent retailers? Or perhaps a mix of them all? Do the research in your chosen market. Make a list of businesses, buyer names, contact info, etc. Keep track of your outreach. Use Google Sheets and you have the start of a mini-CRM! Use the Internet and spend time finding the right points of distribution for your products. #2 – Reach Out: Now you have this great target list. Time to hit the computer, phones or the streets. If you are local or are planning a trip to a market, we highly recommend calling to make an appointment before stopping by. Offer a sample and always follow up. Connect via social media and engage with your buyer. Try to find a “hook” through your research. For example: ”A Yelp reviewer was impressed by your large selection of whiskeys. My award-winning bourbon is very limited and would make for a good addition because……” Be persistent, but not annoying. It’s a fine line that is sometimes hard to decipher. #3 – Reward: Hopefully your persistence will pay off and bam! You get an order. BUT, your job is not done just yet….because…..
#4 – Reorder: Don’t just sell a case and forget about it. The reorder really matters, especially the first one. Reorders prove that there is customer interest and sell through of products. Anytime you open account and sell something, start thinking about the reorder. How are you going to get store/bar/restaurant customers buying your stuff vs. all the other offerings? Offer an in-store tasting. There is nobody better than the Maker themselves to tell their story; however, you can always hire people to help. Liquid to lips! Utilize digital marketing tools (Facebook ads, Google ads) to promote your products to consumers nearby your newest accounts (make sure to check the compliance rules in your state). Offer to train the staff, either in person or via Skype/Facetime. Send sell sheets and/or point of sale materials. Be authentic, helpful and engaging. Your buyer will see the efforts and hopefully the customers will too. Keep all your buyers informed of new product releases, pricing changes, high scores and awards. Anything to help them sell or increase your points of distribution with a new product at an existing, supportive customer. Email lists are a great way to do this, as well as individual texts or calls. Think of all the work you do to reach out to your Direct to Consumer customers. It’s just as important to keep in touch with your trade customers! #5 – Repeat: Find your formula and best sales hook….and do it again. And again. And again. This formula should help you plan and execute your 2019 hustle. We know it’s been working for small and large brands and will continue throughout the new year. Cheers and happy selling in 2019!